Be the star of the next barbecue with Grilled Skirt Steak with Fruit Salsa. 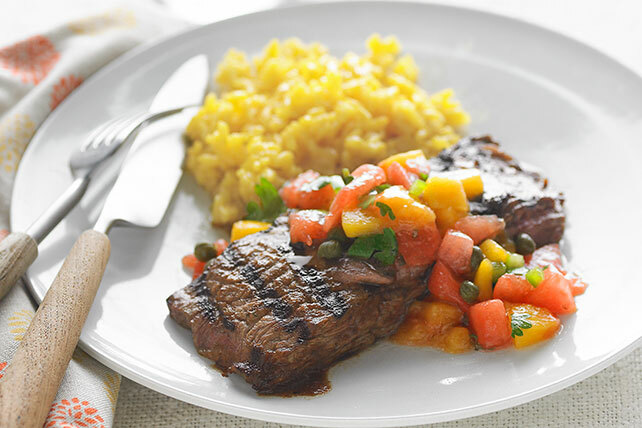 Grilled Skirt Steak with Fruit Salsa gracefully mixes savory and sweet flavors. Blend steak sauce, garlic and 1/4 cup capers in blender until smooth; pour over steaks in shallow dish. Turn steaks over to coat both sides of each. Refrigerate 30 min. to marinate. Heat grill to medium heat. Grill steaks 6 min. or until medium doneness, turning after 3 min. Meanwhile, combine remaining capers with remaining ingredients. Serve steaks topped with fruit salsa. The steaks can be marinated up to 24 hours before grilling as directed. Ripe peaches are intensely fragrant and give slightly to gentle pressure. Avoid those which are hard or have soft, mushy spots or bruises. To ripen peaches, place them in a paper bag along with an apple. Close the bag, then let stand at room temperature for 1 or 2 days or until peaches are ripened. Store the ripe peaches in a plastic bag in the refrigerator for up to 5 days. Choose a watermelon that has a smooth, waxy surface and a creamy-colored underside. If the underside is white or greenish, the watermelon is not ripe. Hearing a thud when you tap the watermelon slightly with the palm of your hand is another sign of ripeness. If you hear a ringing sound, the melon is not ripe.